OoOTie (rhymes with bow tie) is the brainchild of Diego Torres-Palma and Matthew Pearlson, two smart guys who like to dress the part. With impressive degrees in business from Boston University and engineering at MIT respectively, the two friends teamed up to create a neckwear line featuring brainy, quirky patterns and pops of bright color. OoOTie's distinctive styling lets you wear your intellectual curiosity around your neck while at the same time showing that you don’t take yourself too seriously. Tie the knot with a literature motif, math proofs, or the periodic table. Or prove that the bow tie is far from extinct with OoOTie’s Dinosaur design. 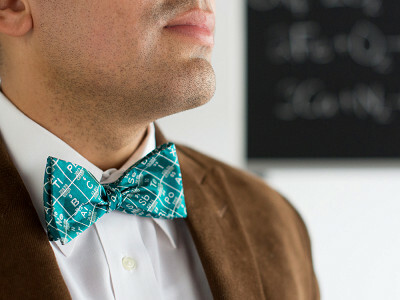 A deviation from traditional neckties, these bow ties are anything but standard. Hello Grommet fans! My name is Diego and I am a Co-Founder with OoOTIE Boston Bow Ties! OoOTie was started to bring you a unique assortment of bow ties you won’t find anywhere else. It's the fun new way to update your wardrobe and sharpen your style. OoOTie and The Grommet also want to hear from wannabe makers and designers today. Have a great idea for a bow tie design? Share it on today's comment board and see the winning design become part of the OoOTie collection. You'll also receive your original custom tie to wear at your next occasion or gift to a loved one. The design competition closes today at 6 PM. The winning design will be announced on Thursday morning. We can't wait to hear your great ideas and see them create one just for you. General contest rules: To enter, you must be a U.S. resident and at least 18 years of age. You must be logged in with a valid email address and leave a comment with a design idea for OoO Ties that you'd like to see them create. One comment per person. No purchase necessary. Winner will be selected and notified via email. Employees, contractors, and the families of employees and contractors of The Grommet are not eligible to enter. Void where prohibited. Contest will end 5/28/14 at 6:00 PM ET. @Amy Boston MBTA map...so when I take the wrong green line train I can find the stop I actually want. @Bobby -- great idea! A Boston themed bow tie for a Boston based company. @Bobby Love it, Bobby. Great idea. how about a margaritaville themed OoOTie? @Ryan Palms trees and parrots - that sounds awesome! An architects compass and French curve resemble a bow tie in a funky abstract way. Those would look adorable! @Vicki That's a great idea and very in line with our engineering background! Thanks for submitting! @Amy @Diego What about gears or a blueprint design? @Alexia I like the gears idea a lot! What kind of gears did you have in mind? Bike gears, watches, or a series of cogs? @Anne keep your eyes peeled. We have a nautical themed bow tie coming out in time for summer. Follow us @oootie on twitter, instagram, and facebook to stay in the loop. The bicycle one s are great but you could go Steampunky with a penny farthing! Very The Prisoner! @Iain Penny Farthing is a slam dunk! Thanks for submitting! @Angela I really like your idea - namely with regards to petroglyphs. I like it A LOT! 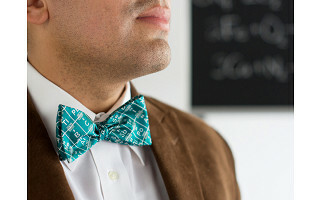 This was such a great suggestion - the winner of our bow tie design idea contest is Petroglyphs! It's the Centennial of The 1915 San Francisco Panama Pacific International Expo next year. How about a design based on the Scintillator? Crazy lighting utilizing the fog! Or indeed anything at the Fair. It was an amazing exposition and quite beautiful. Edison, Burbank and Ford were there as well as all manner of other inventors and famous people. @Iain the 1915 Panama Pacific International Expo was indeed one of our favorite events of that year. Great recommendation! We'll put on our thinking caps and see if we can work Karl the fog into a design with Edison, Burbank, or Ford. With the anniversary of 9/11 coming soon, a tasteful depiction of the Brand new Freedom Tower would be something that could be worn proudly & some of the profits returned to the 9/11 Museum, or other related 9/11 charity. I think a nice blue sky color would be reminiscent of that awful day. I recognize that there is a fine line separating crass commercialization and a tasteful commemoration. @Patrick J thank you for the suggestion Patrick. We'll give this one some thought. All the best from Boston. Scales of justice and gavels. There's an untapped customer base of geeky lawyers. Congratulations to Angela, our winner of the creation contest yesterday. Diego and team will be creating a new design with petroglyphs! We all can't wait to see it being made and bet you can't either. Stay tuned for more info. OoOTie (rhymes with bow tie) is the brainchild of Diego Torres-Palma and Matthew Pearlson, two smart guys who like to dress the part. With impressive degrees in business from Boston University and engineering at MIT respectively, the two friends teamed up to create a neckwear line featuring brainy, quirky patterns and pops of bright color. OoOTie's distinctive styling lets you wear your intellectual curiosity around your neck while at the same time showing that you don’t take yourself too seriously. Tie the knot with a literature motif, math proofs, or the periodic table. Or prove that the bow tie is far from extinct with OoOTie’s Dinosaur design.